U.S., European Subsidies Undercut African Farmers African governments have long complained that U.S. and European agricultural subsidies are undercutting African farmers. Western farm-support programs and cheap cotton dumped on the world market are impeding efforts to end Africa's cycle of poverty. 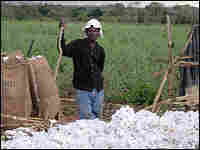 A cotton grower stands in a field in Mozambique. African farmers say U.S. subsidies drive prices so low that they can barely make a profit. 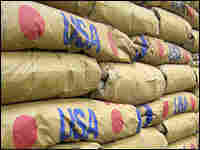 Bags of U.S. cornmeal are stacked in a U.N. World Food Program warehouse in Blantyre, Malawi. 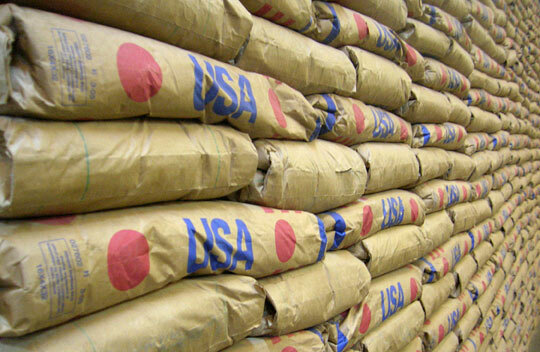 The United States ships millions of tons of food aid to Africa each year. While the food is desperately needed in many parts of the continent, some activists and economists say the inflow of huge amounts of surplus Western-grown grain stifles agricultural development in Africa. African governments have long complained that U.S. and European agricultural subsidies are undercutting African farmers. Western farm-support programs and cheap cotton dumped on the world market are impeding efforts to end Africa's cycle of poverty. In northern Mozambique, cotton farmer Americo Candido Asan says U.S. subsidies drive prices ever lower, making it difficult for him to make a profit. Candido, 35, plants five acres of cotton each year. He does all of the work in his fields by hand. Once a year at harvest time, the local cotton company sends a four-wheel-drive truck to pick up his sacks of cotton. "Here in Mozambique we don't have any help from the government," Candido says. "So if they have subsidies, it means American farmers have everything prepared for them. But here we are using our own money, our own labor, and the price always becomes lower and lower because of them -- the Americans -- it's not fair." Cotton is grown in several parts of Africa. It's a major crop in South Africa, Zimbabwe, Malawi and Tanzania, as well as Mozambique. There's also significant cotton production in West Africa, particularly in Mali, Burkina Faso and Benin. Cotton exporters say this part of northern Mozambique should be able to sell cotton at competitive prices. It has plentiful rainfall. Labor, at about $1 a day, is cheap. The main roads have been rebuilt after a lengthy civil war and are in excellent shape, by African standards. There's a functioning railway linking the area with a port on the Indian Ocean. But growers complain that they're barely making a living from their crops, and in recent years, several large cotton companies have gone out of business. Issufo Nurmamade, the owner of a cotton company called SANAM in the city of Nampula, says he hasn't made a profit on cotton fiber in three years, and his business is only staying afloat because he produces and markets cottonseed oil for the domestic market. Mozambique exports all of its cotton fiber. The country used to have factories to spin cotton into thread and there were even several textile factories producing clothes, but they've all shut their doors. The majority of Africans earn a living -- sometimes just a subsistence living -- through agriculture. Mohammed Lamine, who works for Oxfam in Dakar, says the billions of dollars in subsidies paid each year to farmers in the United States and Europe are undercutting African farmers. And it's not just affecting cotton. Lamine says that cheap, subsidized powdered milk from Europe has flooded West African markets. "If you go through the countryside in Senegal or Mali, you won't be able to find local milk... because the powdered milk has destroyed the whole dairy sector in West Africa," Lamine says. Lamine says the agricultural policies of the world's richest nations are choking economic development in some of the poorest countries on the globe. 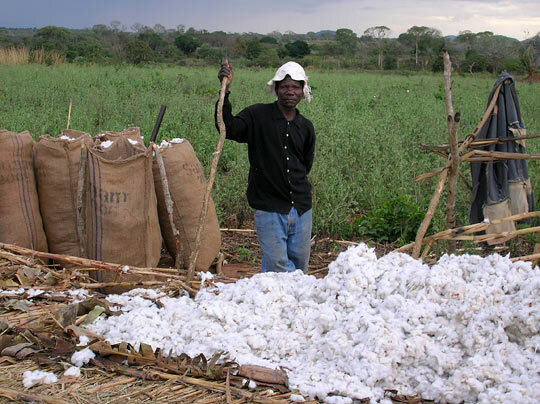 A typical African cotton farmer will earn $300 to $400 a year from his crop. Usually he'll grow other food crops -- corn, cassava, peanuts -- to feed his family. But cotton may be that farmer's only avenue to cash. Oxfam estimates that between 2001 and 2003 alone, U.S. subsidies cost African cotton growers roughly $400 million. Lamine says eliminating all cotton subsidies could raise world prices for the commodity by 10 percent to 12 percent. While an extra $30 or $40 a year might mean nothing to a Western farmer, Lamine says it would be significant for Africans. "Saying that 'If you get rid of all distorting subsidies, producers will be rich,' that's not what we are saying," he says. "But let's get rid of one of the major factors that is contributing to the impoverishment of cotton producers in Africa." Despite falling cotton prices, U.S. cotton production rose 40 percent between 1998 and 2001. Lamine says this extra cotton is being dumped on the global market at below the cost of production. Last year, the World Trade Organization upheld a ruling against the United States stating that American cotton subsidies are illegal. The United States has moved to eliminate export subsidies, but under the farm bill which expires in 2007, the vast majority of payments to U.S. growers continue. In Mozambique, cotton producers say that it's not just agricultural subsidies that are stacked against them. They say the West also dumps second-hand clothes into Africa at prices that stifle local textile production. Vincent Marush Sando, who coordinates a domestic-cotton promotion campaign in Mozambique's capital Maputo, says Africa should place stiff import duties on used clothes from the West. He says the bigger problem is that African nations have very little influence over the flows of global trade. And as Africans try to find their niche in the world marketplace, he says, the system always seems to be working against them.